Colorado has a diverse landscape of desert, rivers, canyons and the Rocky Mountains, which make it ideal for its nature-loving population of more than five million people. The sprawling and natural landscape of Colorado attracts many people for vacations throughout the year, offering ideal climate conditions for outdoor activities from rock climbing to skiing. Similar to national trends, the State of Colorado Substance Abuse Trend and Response Task Force reports that the most common drug of abuse reported in addiction treatment admissions is alcohol, which accounts for 59 percent of 2015 admissions, followed by methamphetamine at 12 percent, marijuana at 14 percent, and heroin at 8 percent. Also consistent with national trends is the prescription opioid concern in Colorado, reported as having increased 68 percent from 2002 to 2014. 2014 and 2015 findings show that Colorado residents who sought treatment for heroin and opioids were more highly concentrated in the southeastern region of the state, while those seeking treatment for methamphetamine mostly concentrated in the northeastern and south-central regions of the state, as well as the Denver/Boulder area. Despite these trends of treatment, heroin admissions for the entire state of Colorado increased 244 percent between 2008 and 2014. During the same period, treatment admissions for methamphetamine increased 34 percent. Also, cocaine treatment admission rates continue to increase among forty-five to fifty-four-year-olds, while decreasing for every other age group. Despite these concerning drug abuse statistics, The National Institute on Drug Abuse (NIDA) reports opioid-related overdose death and opioid prescription rates in Colorado to be well below the national average. Colorado shares the nation's struggles with opioid abuse and addiction and is enacting several efforts to curb the epidemic, such as increasing access to naloxone for opioid overdoses. 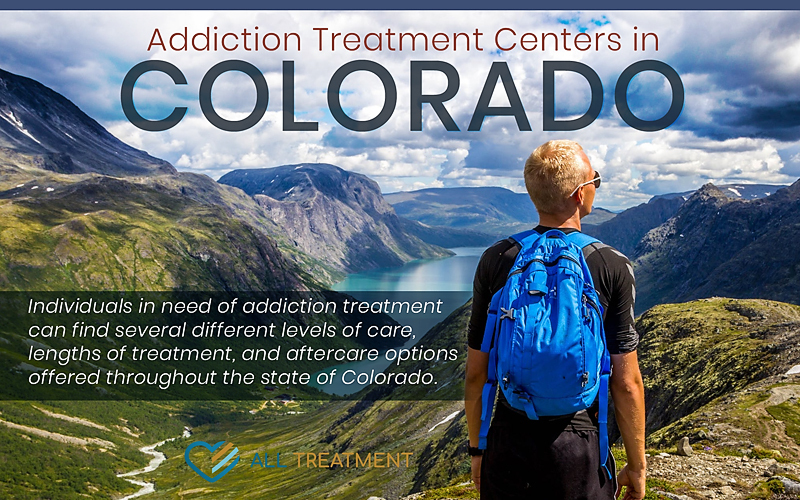 And with more than three-hundred addiction treatment programs, Colorado is also a rehabilitation destination for much private pay or private insurance nonresidents who are seeking treatment. The state has a mix of private addiction treatment and state and locally funded programs at all levels of care.